DFL-200S water well drilling rig is a high efficiency top drive , multifunctional full hydraulic drilling rig, with advantages of advanced technology, ease operation, high efficiency, reliability and durability, widely applicable to drilling water wells, test wells, dewatering well, relief well, geothermal air conditioning hole, coal bed methane, natural gas, oil exploration and other projects, the rig applicable to various stratum by air DTH drilling, has high drilling speed for rock with Platts hardness of f=4-20. 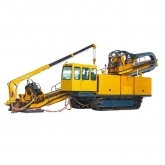 This series drilling rig has a compact size. Body width is only 1.35 meters, perfectly suited for the home farm courtyard drilling or other narrowly drilling conditions. Max. Drilling depth up to 240 meters. The drilling speed, torque, propeller shaft pressure, anti-axial compression, forward speed, and lifting speed are adjustable to meet different drilling conditions and different construction technology needs. Various drilling processes are available on this rig, such as: DTH drilling, through-type air reverse circulation drilling, gas lift reverse circulation drilling, cutting drilling, tri-cone drilling, drilling with simultaneously casing, and core drilling under development. mud pump, foam pumps, generators can be added according to user needs, Drill also comes with a variety of winch as standard configuration. Equipped with cab which meets FOPS / TOPS requirement, using large area glass design, wider field of vision; multi-dimensional wind-type air-conditioning, so that the cab has a master operating experience. Since the full hydraulic top-drive and rotary propulsion upgrade, adapted to the various drilling techniques and a variety of drilling tools, convenient and flexible manipulation, fast drilling speed, auxiliary time is short, high efficiency. Mainly adopt DTH Drilling Technology when Drilling on the rock, high efficiency and lowest cost when single meter drilling. High legs for easy loading transport, direct loading no need crane. Crawler walking more adapted to the muddy field moving. The best impact efficiency of various impactor has its best matched axial force and speed. In the drilling process, with the growing number of the drill pipe,the impactor axial pressure is also increasing, can adjust the positive and negative pressure valve to ensure best axial compression of the impactor during drilling process . In this case it has the highest impact efficiency. Mainly adopt DTH Drilling Technology for rock drilling, high efficiency and low cost when single meter drilling. Crawler or truck chassis for choice.